Absint, that is the Swedish writing for the word Absinthe, is the famous spirit of the Belle Epoque era. Absint was almost 100 years illegal, but recently it got legalized again. You can buy bottles of real Absinthe with thujon / wormwood online at ALANDIA. This Absinthe shop offers a wide selection of Absint and Absint Accessories. Absynt the Green Fairy is green from its color. Its taste can be described as fresh and crisp, as anise (green anise) is a major ingredient of a traditional Absint recipe. Although there are now as well anise-free Absintes on the market, your first absint should be a classic one with anise. This is simply the real thing. Absint contains thujon, an ingredient of the wormwood plant. The Absint Shop ALANDIA sells real, authentic Absint with thujone. Just visit the online store and buy your bottle online. ALANDIA ships worldwide (Sweden, Denmark, Finland, Norway, rest of Europe, USA, Japan etc.). The Absint Shop ALANDIA was established in the year 2001. Since 2001 this store is serving the Absint Community worldwide. We offer an exclusive selection of authentic Absint in our online store. Although the shop is based in Germany, we at ALANDIA ship worldwide. To Sweden or other Scandinavian countries the shipping costs are approx. 10 Euro and shipping takes 4-6 days. Except Norway no duties have to be paid, when you order your Absynthe. For Swedish Absintheurs ordering Absint online can therefore be quite cheap, compared to the normal alcohol prices in their country. So go ahead, and check out the World of Absinthe brought to you by ALANDIA! There are many Absint brands available. The best is if you try out different Absints to find out which one suits your needs best. The best Green Fairy is always the one YOU enjoy the most. Not the one someone else recommends to you. Nevertheless you will find at ALANDIA many Absinthe reviews from other Absintheurs. Have a look at them for inspiration. Now to some basic information about the spirit: There are distilled and macerated Absinthes on the Absint market. Distilled liquors are of a higher quality, smoother from the taste and (unfortunately) as well more expensive. Cheaper Absinthe is macerated Absint. Cheap means in this way, that the production method is less costly, therefore you will find these Absint brands at reasonable prices. 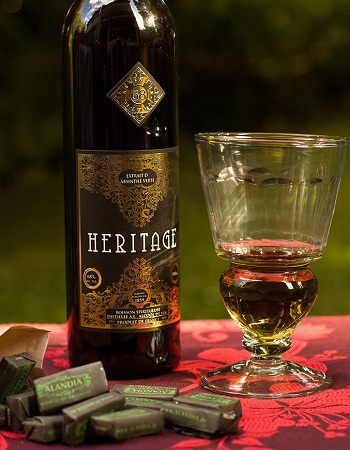 But these Absints are often more bitter from the taste, and more dominant from the herbal flavor. They are not as smooth as distilled ones. You have to try both varieties, to see which one you prefer. Most people prefer distilled absynt. They are softer and easier to drink. Czech Absint is mostly macerated, French Absint mostly distilled. Maybe you ask yourself as well how to drink Absynth the right way? Check out our Absinthe ritual videos in our shop to learn about the French style of drinking Absint. Where can I buy Absint in Sweden? Buying Absint in you local liquor store is difficult to impossible. The best way is, if you buy your bottle of Absinthe online. ALANDIA is the online shop that ships worldwide, including Sweden, Finland, Denmark etc. Besides a large selection of Absint you will also find spoons, glasses, and other accessories in the shop. Check it out, you will not regret it!